Incorporating herbs and spices into your dishes enhances flavor and helps you develop unique spins on typical salads, soups, appetizers, and entrees. However, using herbs and spices optimally requires knowing which herbs are better fresh or dried for your culinary creations and how to switch from fresh to dry herbs and from whole to ground spices. 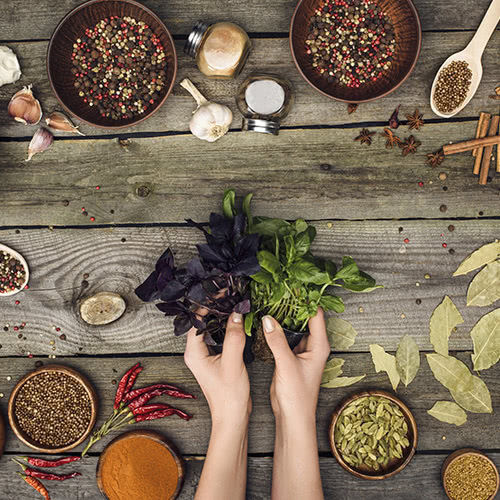 We’ve created a guide below so you can convert herbs and spices properly and best choose between fresh or dried herbs and whole or ground spices for your dishes and kitchen cabinets. Herbs that are better when fresh include soft, tender, and leafy herbs such as basil and cilantro. On the other hand, woody herbs, such as oregano and rosemary, provide great flavor when dry. Below is a guide that shows which types of herbs are better fresh or dried along with tips for using each. You can easily use the majority of herbs in both their fresh and dry forms. While some herbs may be better fresh or dry, both forms will still provide flavor and zest when added correctly to your dishes. 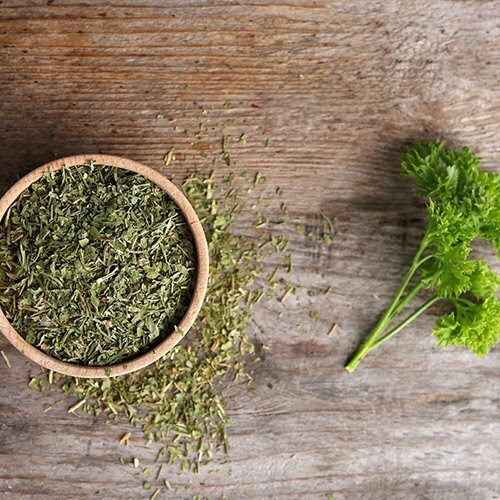 Dried herbs have a more concentrated flavor than fresh herbs, so less is required when cooking. Dried ground herbs are more concentrated than dried flaky herbs, so even less is required. The majority of herbs can be converted from fresh to dry using the 3 to 1 ratio and from fresh to ground using the 4 to 1 ratio. However, there are some exceptions which are shown in the chart below. Most herbs, such as cilantro, dill, oregano, rosemary, and thyme 1 tbsp. 1 tsp. ¾ tsp. Basil 2 tsp. 1 tsp. ½ tsp. Bay leaf 1 leaf 1 leaf ¼ tsp. Parsley 2 tsp. 1 tsp. ½ tsp. Sage 2 tsp. 1 tsp. ½ tsp. Ground spices tend to lose their strength over time. On the other hand, you can grind whole spices right when you need them, giving you freshly ground spices and a stronger flavor. Spices have their freshest and most robust taste right after they are ground, so keeping whole spices around can lead to more flavorful dishes. Unlike herbs, you will find most spices at the store already dried, as they come from the root, stem, seed, fruit, flower, or bark of the tree or plant. Herbs typically come from the green, leafy part of a plant. You will find most spices in powders, but a fair share can be stored in their whole form and ground at home. 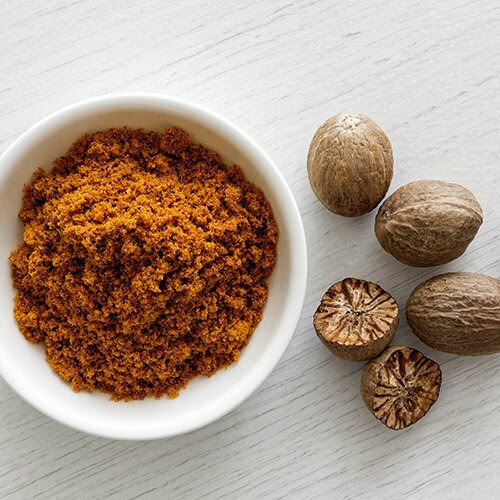 If a recipe calls for ground spices and you have whole spices on hand, follow our guide below to know how much whole spice you need to grind. Allspice 1 tsp. 1 tsp. Black pepper 1 tsp. 1½ tsp. Cardamom Approximately 12 pods, dehusked 1 tsp. Cinnamon 1 stick (1½-inch) 1 tsp. Cloves 1 tsp. ¾ tsp. Coriander 1 tsp. 1¼ tsp. Cumin 1 tsp. 1¼ tsp. Fennel 1 tsp. 1¼ tsp. Ginger 1 tbsp. fresh ginger ¼-½ tsp. Nutmeg ½ nutmeg 1 tsp. Mustard seeds 1 tsp. 1½ tsp. Turmeric 1 tbsp. fresh turmeric 1 tsp. While some people may estimate, it is worthwhile to know the exact measurements. This way, you will avoid grinding too much of your whole spices and can conserve them to grind fresh spices for future culinary creations. Consider the fresh peppery taste of basil on a tomato mozzarella sandwich, the woodsy, savory flavor of rosemary chicken, or the earthy touch of nutmeg in a sweet butternut squash soup. Many dishes wouldn't be complete or as flavorful without the help of herbs and spices. Nature helps you get creative in the kitchen, and you can even try incorporating plants into your signature drinks as well. Should You Choose Locally Sourced Food for Your Restaurant? A WebstaurantStore account is required to comment. Already have an account? Log In Here or Create an account. Check Us Out, We're Social! Sign up to receive coupon codes in your inbox! Your email subscription has been recorded! Thank you!